Set in the fashionable heart of Canary Wharf in a luxury development with superb communal facilities, this bright white studio flat enjoys a contemporary interior with designer appeal. Pan Peninsula offers an amazing selection of communal facilities, including an on-site gym, swimming pool, health spa, restaurant and cappuccino bar, cocktail lounge located on the 50th floor, a residents' cinema and concierge service. 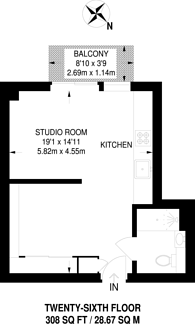 308 (28 Sq M) approx.